SO Ive had a few requests to write up some baby food recipes. One benefit Ive found is I can throw some of these purees in my daughter’s food. She is picky and it seems to be the only way to get the proper nutrition to her little body. 1.) Root trio: carrots, sweet potato and parsnips. Boil the berries with about 1/2c purified water for about 5 or 10 minutes or until blueberries pop. Puree together. I save the water from the bottom of the steamer so I can use it as a drink or add in my daughter’s food such as spaghetti sauce. Clean chicken breasts and place in pot. Pour purified water over the breasts until covered. Bring to a boil and allow to simmer for about 2 or 3 hours or until chicken is tender. Add the chopped veggies and cook for another hour or until veggies are tender. Drain and set aside the stock. Blend the solids pieces together in a blender. Add some of the stock to moisten to baby’s required cosistency. Save the stock, I use it my daughter’s food! Serve with some organic butter, coconut oil or melted coconut butter. Bring about 1c purified water to a boil with the pear and cook until soft, typically about 5 or 10 minutes. Drain and save water. Peel and cut mango. Puree in blender while adding some of the saved water. I sometimes mix this one in the soup to make it softer. Same process as above but cook apples too. NOTE: Apples and pears have pectin which can slow digestion down too much for baby so we cook it to remove the pectin. You can basically pair any fruit together. Avocado, mango, papaya and bananas dont need to be cooked. The other fruits are better cooked. I havent yet experienced with green veggies yet, but I plan to do broccoli and when I do I will steam it with fresh garlic and puree together and add a little dash of salt and butter to it to make it tastier.! 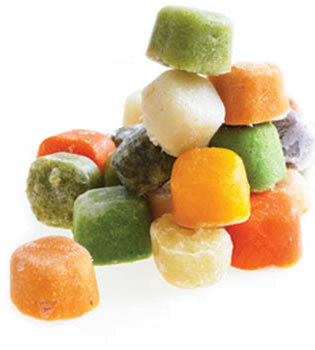 The best way to store these foods is to buy a baby food ice cube tray. I then pop them out once frozen and store in freezer bags. Very convenient! Just remember to defrost overnight!